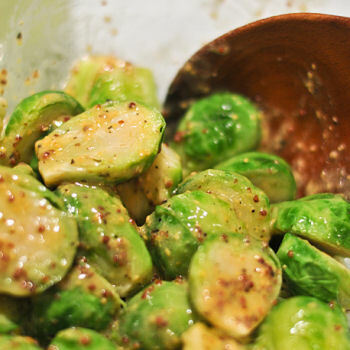 This is one of the best recipes I've ever tried for sprouts and is great for cabbage too. Steam or boil sprouts for 5-8 mins. until al dente. Mix all the other ingredients except oil in a small bowl. Slowly whisk in the oil. Cut sprouts in half & toss with the vinaigrette & serve (coring the sprouts removes the bitterness).